Stopping a car and parking up on the left is something frequently requested by the examiner during each and every practical driving test. The driving examiner wants to establish that you can do this safely, with regard to other roads users and also that you are not a danger to pedestrians in that you do not hit the kerb (or ‘curb’ as it’s referred to elsewhere) or mount the pavement. Examiners have a strict protocol for stopping a car during a test, and many driving tests are failed each year due to this seemingly simple task conducted inappropriately by the learner driver. This tutorial will guide you through the correct test standard procedure for stopping a car on the left, along with tips and information to remedy errors made during a test. This tutorial is for learner drivers or drivers with previous experience wishing to take the UK practical driving test. 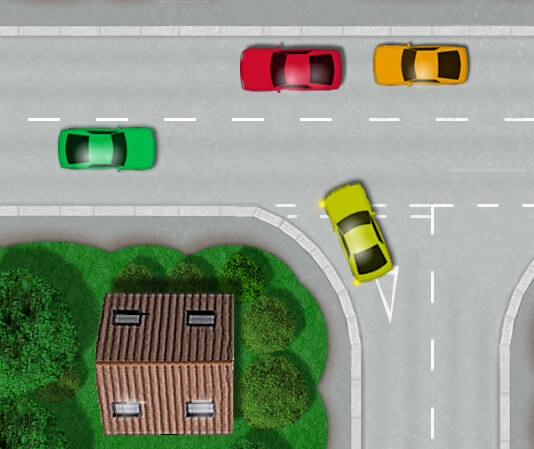 The tutorial is essentially for manual cars and is for stopping a car on the left alongside a kerb which is frequently requested during a driving test. Let’s imagine you are driving during a driving test and the examiner requests that they would like you to park up on the left. The examiner will be assessing your ability to stop the car in a Safe, Convenient and Legal Position. The examiner isn’t looking for you to stop as quickly as you can, so look well ahead for a place to stop that isn’t on too much of a bend, is not too close to a junction on the left and not opposite a junction on the right (see left column for further details). Examiners will not request that you stop the car in an area that isn’t permitted to park. You should however still keep a keen eye for signs that prohibit parking and double yellow lines. Parking in such areas will fail the driving test. Ensure you do not park across or partially across a driveway entrance to house. Although this isn’t likely to fail a driving test, it is likely to incur a minor. Although a driving examiner will not trick you into stopping the car illegally, they may possibly ask you to park in an area where many of the vehicles are parked on the pavement. Parking on pavements although technically not illegal if there are no signs prohibiting such actions and if it is outside of London, will instantly fail a driving test. As soon as the examiner has requested that he would like you to park up, take a look into your interior mirror. This isn’t a requirement, but it will enable you to know exactly what is going on behind you. If there are no vehicles behind you, slow down slightly to aid in your parking. Once you have located a safe, convenient and legal position to stop the car, look into your interior mirror and your left side mirror. It may be necessary to check the left car blind spot if there are cyclists in the vicinity to be safe. It is not necessary to indicate to the left if there are no other vehicles, cyclists or pedestrians in the area. If there are, then it is important to indicate to the left. If you are unsure, indicate anyway. It may be easier to get into the habit of indicating after the mirror checks regardless of any other vehicles, this way there is no chance of problems arising. You will now need to ‘cover’ the clutch and the brake. This will enable the car to gently slow down as the engine is still engaged but no power is applied to it. Steer to the left in small increments to get closer to the kerb slowly. Steering too harshly may result in the front wheel hitting the kerb. It can be difficult for learners to establish where the kerb is in relation to the car. Using reference points can help to obtain a suitable and good position for parking next to the kerb. See kerb parking for further information. 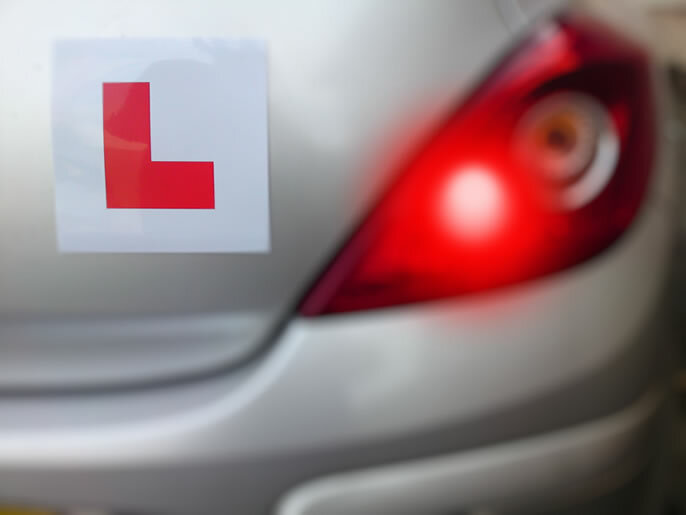 It is also relatively common for learner drivers to hit or scrape the kerb during a driving test. This is not necessarily a failure depending on the severity or situation. If you are prone to this, read the guide for hitting the kerb for attempting remedial action during a driving test. As you get closer to the kerb, steer to the left in smaller increments to avoid hitting it and now gently apply pressure to the brake. Around 4 to 5 metres from where you intend on stopping, fully depress the clutch. Pressing the clutch too late may result in stalling the car. Try not to press the clutch too early as this may result in coasting. Just before you stop the car, straighten the steering wheel. If parking behind another vehicle, ensure you leave enough room to move off again without the need to reverse. Once stopped, apply the handbrake, select neutral, cancel the indicator if applicable and release your feet from the pedals. There is no need to turn the car off. Now that you have stopped the car, assess the situation. Look into your left mirror to establish if you have stopped an appropriate distance from the kerb. Take a look around to ensure you haven’t stopped near any junctions or that you are parked across or partially across someone’s driveway entrance. If you have parked inappropriately and you are not happy with your current parking position or location, explain this to the examiner and take remedial action to correct this. There fact that you have recognised your error however may be enough for the examiner and they may inform you that it is not necessary to correct. Stop the car in a safe, convenient and legal position, not too close to junctions or covering driveway entrances. It’s essential to use the appropriate mirrors. Check the blind spot is necessary. Avoid hitting the kerb and use reference points to help you park. If you are not happy with your parking, tell the examiner and try again. The blind spot is an area that cannot be observed in the mirrors and requires physical movement of the head in order to be covered. Although it’s not essential to look into the blind spot when parking the car on the left, if cyclists are in the area, it may be necessary to check the blind spot to ensure there are no cyclists alongside your car before moving over to the left. The driving test will involve the examiner asking you to stop the car on the left on many occasions. Stopping a car opposite a junction on the right can be hazardous as shown in the diagram below. The car turning left out of the junction is primarily observing to their right as this is where the most hazards are likely to come from in the form of oncoming vehicles and cyclists. 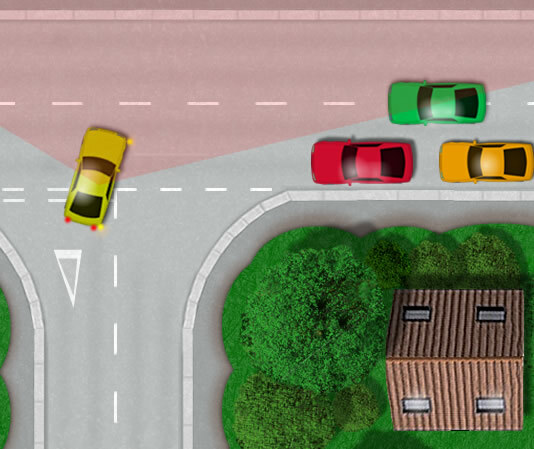 The moving green car needs to manoeuvre past the red and orange parked cars into the same lane as the emerging yellow car. Stopping near a junction such as the red and orange car in the diagram is hazardous for the yellow car exiting the junction as the parked cars are obstructing the view of oncoming vehicles. The moving green car is passing the parked cars into the path of the emerging yellow car. Parking too close to a junction can also make it difficult for emergency vehicles to gain access or emerge from junctions.